The Spectrum CAD Library is one of the most complete FRC CAD libraries avliable anywhere. 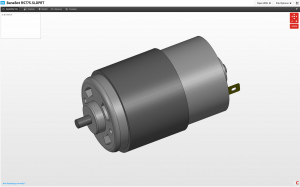 All the parts are saved in the Solidworks format. Most of the parts are currently saved as Solidworks 2014 files but will slowly be upgraded to 2016. It currently includes most COTS items from standard vendors like AndyMark, VEXpro, WCProducts, and more. Many sections are still incomplete but we will be updating them as the season goes on. Very little of this content was created by Spectrum but instead it’s a curated collection of freely available items. Thank you to the many people and organization that have made and released CAD models such as Solidworks, VEXpro, AndyMark, Team 610’s Part Library, MVRT CAD Library, McMaster-Carr, Andrew Lawrence’s gear library and various vendor websites. If we forgot someone whose files we complied into our collection please let us know, we have been building this for several years so a few people/groups have probably slipped through the cracks.